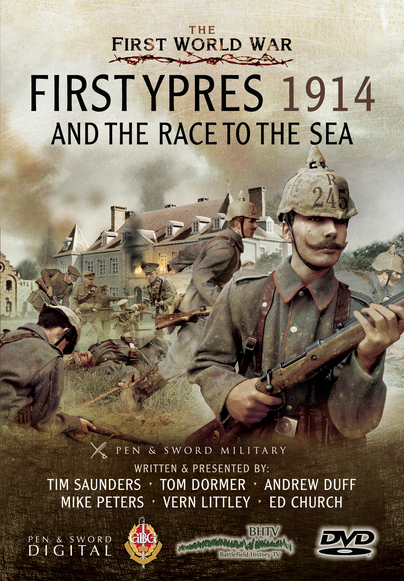 You'll be £16.99 closer to your next £10.00 credit when you purchase First Ypres 1914 and the Race to the Sea. What's this? Order within the next 2 hours, 44 minutes to get your order processed the next working day! With the Battle of the Aisne grinding to a halt as trench warfare gradually set in, both the German and Allied commanders realised the dominance of the defensive, established by quick firing artillery and the machinegun, meaning that casualties in frontal attacks on a dug-in enemy were enormously heavy. Consequently, the armies sought to outflank the opposition by heading north in a set of manoeuvres known as the Race to the Sea. During this phase Field Marshal French insisted on redeploying the British Expeditionary Force to the Allied left, nearer the Chanel ports. They came into action, division after division, from the La Basse north towards the city of Ypres in a series of bitterly fought meeting engagements, in which both the British infantry and cavalry continued to outperform their opposite numbers, but neither side could obtain a decisive result. Finally, on 21 October 1914, with General Haig's I Corps coming into the line north of Langemark a solid line of trenches that stretched from the North Sea to the Swiss Jura was being established. The German Schlieffen Plan had failed back in August and now they concentrated as much of their force as possible to break through the ragged British and French Lines around the Belgian city of Ypres. Blow after blow fell but the line held but only just. The BHTV team of military historians and battlefield guides take us to the muddy fields of the emerging Salient. To name but a few locations they take us to the scene of the Gloucester's defence of Langemark and the attack of the 'German Student Corps' and the resulting 'Massacre of the Innocents' as the young men bravely marched into the concentrated fire of the Old Contemptibles. At Whschete Ridge, the team examine how the crumbling line was reinforced and held at tremendous cost by the first units of the Indian Corps to arrive and how on Halloween's Eve the Territorials of the London Scottish fought another desperate battle to hold the Line in the same area. The crisis of the battle was at Gheluveldt where massing a ratio of six to one and with the Kaiser himself present on the battlefield the Germans aimed to punch up the Menin Road. Under crushing artillery fire the British defences were rapidly wasting away. Field Marshal French sent a message to Foch 'My line is broken, I have no more reserves … the last of the British will die fighting!' But he had a reserve! 2nd Worcesters were ordered by Brigadier Fitz Clarrence VC 'To advance immediately with the utmost dispatch and clear Gheluveldt of the enemy …' The resulting action has gone down in history as the Charge that saved the Empire.